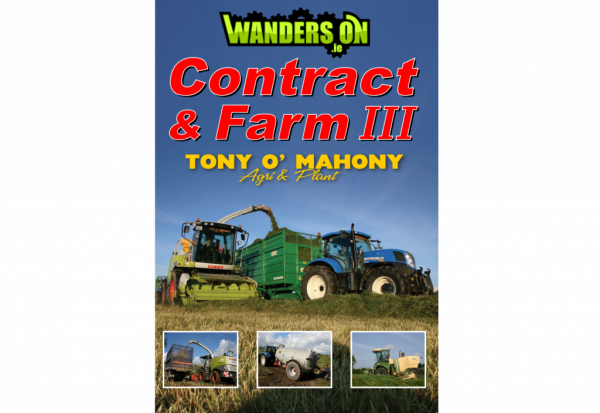 This is the third volume of the WandersOn Contract & Farm DVD series. In this DVD, we follow Tony O’Mahony Agri, Plant & Haulage based near Bandon in Co.Cork. O’Mahony’s run a high output silage & maize outfit with a new Claas Jaguar 970, a Krone Big M, & Volvo L60G loader with 3 Volvo trucks hauling alongside their New Holland tractors with Smyth & Thorpe trailers. They also run a McHale Fusion 2 for their baled silage operation. We look at their slurry tankers and umbilical pipe system working as slurry is an integral part of their business. We finish up spending a day on the new Volvo FH 12 with low loader moving containers & excavators.